New York based, Australian duo WAZU will be taking the stage over in Brooklyn at Cameo Gallery on Tuesday, January 10 at 8PM. Swing over and check them out. If you aren’t familiar with the duo, we have for you in our MP3 Grab at the bottom of the post, the first single, “Murder 1” from their upcoming debut EP. The Kevin McMahon produced EP is scheduled for release on January 10 via Anti-language Recordings. 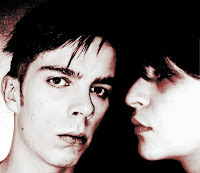 WAZU is Matt and Rizz – an Australian-American glam/grunge/electronic/pop duo based in New York City by way of Sydney. Matt and Rizz met as freshmen at The University of New England in Armidale, New South Wales, Australia, and after writing and performing together in several influential Sydney bands, including Open the Gates and Captains, the two decided to officially become a duo and further explore the chemistry and ideas that so naturally occur between them. In their first week as WAZU, the duo performed seven shows in six nights at the Top 10 “Best of the Fest” Festival at Toronto Indie Week 2010. “We showed up planning to play three shows, but [we] kept winning!” Shortly after, the band performed as part of the CMJ Festival at Lower East Side staple The Living Room, the Neon Reverb Music Festival in Las Vegas, and the Dropout Party at Don Hill’s in New York City.